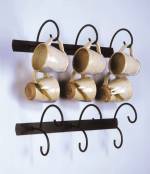 Our brand new Mahogany Four Arm Mug Display comes in a set of 2 so that you can have all of your coffee mugs and tea cups on display and close at hand. Measuring 15.25" tall and 7.25" in diameter, these sturdy stands are ones you'll want to use all the time! The beautiful mahogany finish and modern details bring a contemporary flair to your display.